Templates are little snippets between double accolades what you can insert while editing the Wiki. They will be automatically replaced to the template's content, for example a large blue box with predefined text, when viewing the page. Templates are wiki pages that start with the string "Template:". They are in a separate namespace separate from the main wiki pages, so they do not appear in search results by default. There is a "Template" category, for now unsubdivided. You can see all available templates here. These templates are temporary. They are meant to be removed when the requested edit has been performed. So we give them the yellow "Post-it note" background. To propose a page for speedy deletion. If this note persists without edits in the history, feel free to remove the Editing template from the page. When you want to mark an incomplete Wiki section. This template will add the article to the Improve category. Need improvement: This article or section needs improving. Feel free to add content. Add your signature! In order to help others follow the discussion, please add your signature. You can automatically add your signature by typing the signature tag --~~~~ or using the 2nd button from the right above your input box. Mark an article or section which needs to be written. Section or article which needs to be written, development or other task which has to be done. NOTE: This is an important note here. Hardware wishes warning! This article or section documents a Hardware Wish List item, the features described here may or may not be implemented in future devices. Outdated warning ! This article or section is significantly outdated, either by significant hardware or software changes. Procedures mentioned in this page may well not work for current hardware/software. Openmoko wishlist item, not hardware (see Hardware_Wishlist above). An external link to a ticket on the general trac. The template does not care if the ticket is closed or open. An external link to an application page on opkg.org. When a section in an article is basically a reference to another complete Wiki page, you can supress longer explanation by linking to the main page. For tables with various featrure lists and others, where these values are possible. Navigation boxes provide inter-pages links to related subjects. There can be also "See also" and "References" sections at the end of the page. How to best this implement interpage contextual navigation is still under discussion. Trial and error ! Standardize colors: Background: orange/black, white, CSS-defined. Get rid of aliases and redirects. Todo: change all references to the old template Gta02menu to this one, then delete old template. 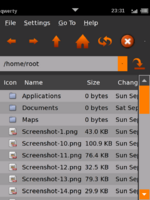 A file manager application with MIME types and remote access support from the the GPE Palmtop Environment (GPE) project. This page was last modified on 20 October 2009, at 14:40. This page has been accessed 34,540 times.